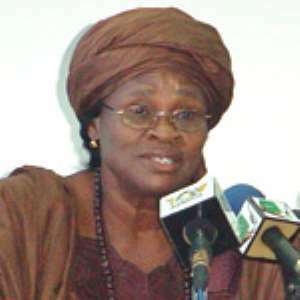 Gladys Asmah Cause "Financial Loss To State"
The Ministry of Women and Children Affairs has been saddled with over ¢50 million debt because of Mrs Gladys Asmah's decision to publish a book of speeches she delivered between 2001 – 2002. Information available to the Free Press from reliable sources disclosed the decision to print the books was solely taken by the Minister without the consent of the chief director of the Ministry but instead the Public Relations Officer, Mr Anthony Obeng was used as a front for the printing of the book of which the cost of printing was borne by the ministry. Evidence available to the Free Press indicates that Hon Gladys Asmah the minister and MP for Takoradi ordered Venue Printing Press Ltd to print the 114 page book and edited the contents herself. Sources close to newsmen noted that after the books were published in June last year, the Minister took the books along on some of her foreign trips and sent some to other ministries including the office of the chief of staff. Investigation revealed that when the chief of staff saw the books he queried the minister, but Mrs Glady Asmah shifted blame to her public relations officer and subsequently sacked him from the ministry. She also instructed the public relations department to stop the distribution of the books. She also wrote a memo refusing the payment of the printing cost to Venus Press. Meanwhile the rest of the books Free Press learnt have been packed in the ministry, while the printers are continuously putting pressure on the ministry of their money. Sources close to the printers told the Free Press that Venue may have no choice but to resort to the court of law to claim their money. She also instructed the public relations department to stop the distribution of the books. She also wrote a memo refusing the payment of the printing cost to Venus Press.